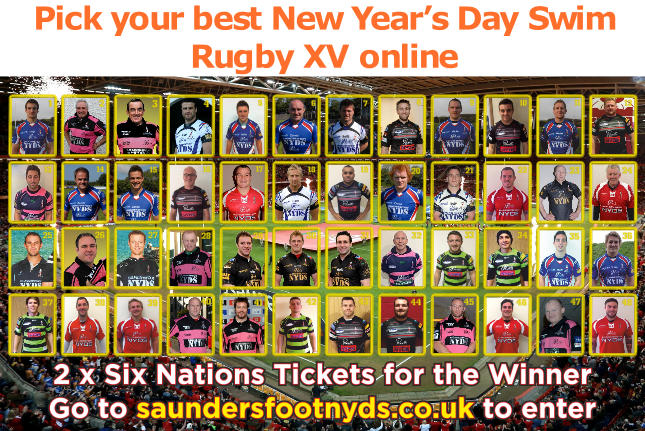 Pick your best rugby team from the listed players below (As shown in the photograph above), all of whom have worn a Saundersfoot New Year’s Day Swim shirt. Most are Welsh internationals but there are also South African, English, Irish, Scottish and New Zealand internationals. There are 8 forwards to choose and 7 backs plus we would like you to nominate one of your chosen players as captain. An ex-welsh international will select a team and the person whose selection is closest will receive 2 tickets for the wales v ireland match in march.